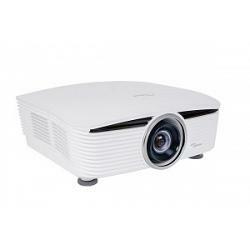 Optoma X605e Projector XGA (1024x764), 6,000 ANSI Lumens, 2.000:1 contrast, 5 interchangeable lenses from 0.8:1 to 5.18:1 , No lens included, H and V Lens shift, 3D Sync Out, Display port, HDMI, VGA In/Out, Wired remote, 18.6lbs, Warranty: 3-year Optoma Express Replacement, 1 Year lamp warranty. ORDER LENS SEPARATELY Bright crystal clear images for large venue applications. Unsurpassed color accuracy for the most impactful presentations. Vertical and horizontal lens shift for ease of installation. Optional lenses for maximum installation flexibility. 360-degree operation. 6000 Lumens XGA. The Optoma X605e was designed to deliver extraordinary performance and superior reliability to satisfy your large venue projector install needs. Its powerful 6000 lumens bright output combined with a remarkable 2000:1 contrast ratio deliver amazingly bright, color-rich presentations with sharp, clear text and graphics. 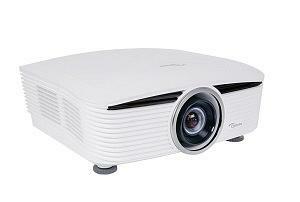 The Optoma X605e features one of the most comprehensive input panels and most advanced feature set in its class to ensure the projector will satisfy your current and future needs: HDMI, display port and DVI for digital connectivity, 2x VGA inputs and one VGA out for analog content, vertical and horizontal lens shift, discrete audio inputs, 12 volt trigger for maximum installation convenience. Just a few of the many outstanding features on this remarkable product. Order in the next 04:46:43 Hours to Ship Today Place your order by 3:30 PM Today and your order will ship the same day. For further details and delivery estimates check our shipping page. Remember to select the desired service level needed in your cart. All orders are subject to verification. International orders are processed the next shipping day.